The West Stand at Elland Road was built in 1957 and replaced the old West Stand which was destroyed by fire. The new stand cost £180,000 to build and was funded by an appeal from the club raising £60,000 with the Leeds City Council also helping out with finances. Originally the West Stand had terracing on the front paddock which had a capacity of 6,000 and seating at the rear which housed a further 4,000 spectators. 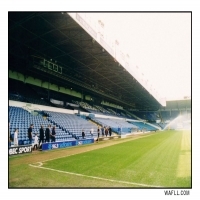 Later the West Stand became an all seater stand and is considered the major stand at Elland Road. In 1970 the West Stand was streamlined with the Kop after the North West corner was built at a cost of £200,000. After the death of John Charles in 2004 the West Stand was renamed the John Charles Stand in tribute to the great Leeds Utd player.